Great boats. Great rates. Delivery available anywhere in Lake Country. 260 HP, a thumpin’ stereo, and a wakeboard tower. Sounds like a great day on the lake to us. This boat is a lot of fun. Have a great time on the lake in this well appointed, high-powered boat. We take great care of our boats and ensure the Four Winns SS is well maintained, clean, and ready for you to enjoy. If you’re looking to have a great day out on the lake wakeboarding, water skiing, and tubing, this is the perfect boat to do it in. At 260 HP it’s got plenty of power but is manageable for most people. You’ll have a great time. Eight hour rentals include an accessory of your choice. Open 7 days per week. Delivery available. Gassed & ready to go! 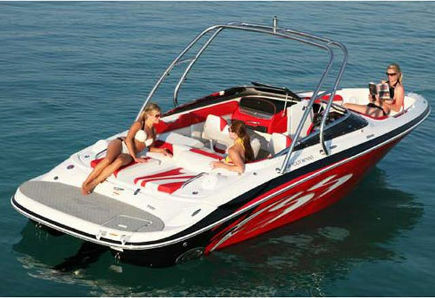 The Four Winns SS is a great speedboat that’s perfect for a family or group of up to 8 people. While powerful, a novice operator can quickly gain confidence. The Okanagan lakes have lots of room for you to cruise in. At 260 horsepower, this boat has enough power to be a great time. However, it must be operated safely as it is capable of “outperforming” its operator. Always follow safe operation practices when behind the wheel, and of course, never operate while intoxicated. If you do not have a boat license, we will perform a walk-around of the boat and familiarize you with its controls. In addition, we will teach you how to operate the boat and what to do in the event of an emergency. Once we have completed the walk-around we will provide you a temporary license that serves as proof of your ability/competency to operate a boat. Included in an eight hour rental is a water accessory of your choice. 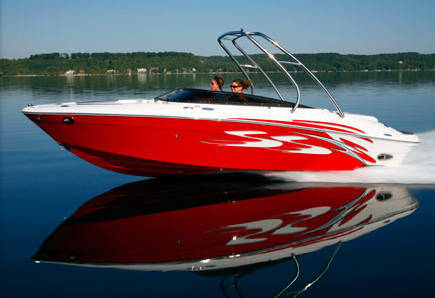 This boat is the ideal choice if you’re looking to really go fast and have some fun on the lake. It will tow a tube, skiier, or wakeboarder no problem. Our equipment is well maintained. We make sure our equipment is ready for you! We have a life jacket for everyone! All our life jackets are new, comfortable, and made by a quality brand (Hyperlite). We’ll make sure that kiddos are comfortable, too! Adult sizes range from XS to XXL. All boat operators are required to have at least a valid class-5 license. Operators must be at least 21 years old. Operating the boat while inebriated is not allowed. We’ll deliver the boat with a full tank. There are several options on the lake for fuel, though marine gas on the water is considerably more expensive than what we would charge if you were to bring the boat back un-fueled. You are free to bring the boat back for us to refuel for you- we’ll add the cost of fuel to the final total. This not only allows you more time on the water, but saves you money. Please treat the boat like it was your own. Renters are fully responsible for the boat and all incidentals for the duration of the rental. Boat repairs can be expensive- please take care of the boat so we can keep it looking awesome for all our customers! Delivery is free to the Okanagan Centre boat launch. All other launches starting at $75. Renting a boat is about having a good time. The Okanagan is lucky to be one of the most beautiful places anywhere in Canada, and the best place to enjoy it is on the water. Kick Back, relax, and enjoy!